We can't advertize low prices for some brands on our web site due to manufacturer requirements. The list of brands are below. If you want to find the Final Price of item, please, add an item to the shopping cart. The Final Price will be lower (selected models only) than you see it in the search engines or in the product pages. After your order is placed, you will receive an e-mail confirmation of your order. In the event that you do not receive an order confirmation, you must and we will send back an email confirmation to you. For security reason we request verification for orders with different shipping and billing addresses. If you receive verification request from our customer department, you have to fax us a photocopy of your credit card (both sides) and photo ID. We hope you understand that when we have to take extra security measures such as this, we do it to protect you as well as FaucetLine.com. We can ship your order to billing address with no verification. Once we have verified your payment, your order is sent to the warehouse to be fulfilled. We offer same day shipping for most of items. If your item is in stock, your order will be shipped in the same day. Orders placed on the weekend and holidays will be processed the following business day. If an item is a special order or temporarily out of stock, we will contact you ASAP by e-mail with the estimated lead time. In some instances, you may have a specific requirement regarding the size, finish and style of the decorative item. In these cases, you will need to order the items directly from us by sending an email to Customer Service. We will be happy to assist you with any special needs. Most of the products will ship standard UPS. However, due to weight, distance, and/or special packaging requirements, your UPS shipment may have an additional surcharge, which will be reflected on your checkout page. The best way to find out your shipping total is to add the item(s) to your shopping cart, enter your shipping information and proceed to the billing screen. It will then calculate your shipping total before you finalize your order. If an item is a special order or temporarily out of stock, we will contact you by e-mail ASAP with the estimated lead time. In-stock orders take approximately 1 - 7 business days to arrive anywhere in the 48 contiguous U.S. states. Orders shipped to Alaska and Hawaii or any area that is not within the 48 contiguous U.S. states may take longer. Orders shipped to Alaska and Hawaii and any area not within the 48 contiguous U.S. states are subject to an additional shipping charge. We don’t ship to Canada and Puerto Rico. Due to demand, selected items may be out of stock. If an item is not yet available, we'll use our best efforts to give you the anticipated delivery date when you place your order. Anticipated delivery dates are based on information supplied to us by the manufacturer and are subject to change. If this applies to your order, we will notify you ASAP. If an item is not scheduled for delivery within 10 days of your order, we will attempt to notify you of the backorder status. If we cannot get in contact with you, we will decide on a case-by-case basis whether to schedule delivery or wait for approval of the lead time. Some items cannot be shipped via UPS because of their weight. In this case, we use a private freight company to ship the item. Freight delivery time vary, but usually range between 3 to 12 days. We always ship orders from the warehouse nearest to you. The shipping charge to HI and AK is not calculated correctly on FaucetLine.com web site. Please, contact our customer service to check actual shipping charge and transit time prior order. If you place an order online our customer representative will contact you to confirm actual shipping charge. Your order will be on hold until we get your approval. NOTE: Free shipping offer is not applied to HI and AK. Sales tax is added to all orders delivered in New York State based on the prevailing rate of sales tax. Tax exempt organizations located in New York must fax a copy of their tax exempt certificate and a copy of their invoice to 1-516-908-4879. Upon the receipt of this information we will remove all tax charges from the purchase. For all orders outside of New York State, no sales tax is charged. We charge CA Sales Tax when order shipped to CA residents for the following products: Aco, Dawn, Dynasty, EAGO, HANSA, Kimball and Young, KWC, Mountain, Richelieu, Rohl, Toto, and Waste King. We charge CT Sales Tax when order shipped to CT residents for the LessCare products. We charge CA, CT, FL, GA, IL, KY, MA, MI, NC, NJ, OH, PA, SC, TN for the Richelieu products. PLEASE NOTE: Due to different versions of browsers and operating systems, the sales tax may not be automatically calculated at the time of placing your order. In this case we will charge additional Sales Tax amount. Delivery time vary. Unfortunately we do not guarantee any delivery time. This is because we are dependent on outside delivery agents such as UPS who do not guarantee their delivery schedules. Please do not schedule contractors until your products arrive. FaucetLine.com will never be responsible for any time guarantees in shipping, and we cannot and will not be responsible for any inconvenience or any monetary loss, penalty, or extra charge incurred by our customers should any delivery take longer than anticipated. That being said, we strive to provide accurate lead time and timely updates should any lead time estimate change. We value our customers, appreciate their business, and will do everything in our power to serve you well. If the product you ordered arrives via UPS do not sign for delivery and do not accept receipt of any products that are visibly damaged. If a product appears to be damaged, please refuse delivery of the item and notify us immediately via email. Should your package not arrive as the scheduled date stated in the Shipping Notification email, please contact us so that we can put a tracer on your delayed package. Most of our shipments contain valuable items, so our carriers are required to obtain a signature upon delivery. In some cases the UPS or FedEx may leave the package at the door If nobody is available to sign the delivery receipt. FaucetLine.com is NOT responsible for packages left at the door, but we are willing to assist you in the investigation of the loss package. If UPS/FedEx is unable to deliver a package as addressed on order form, UPS/FedEx will determine and make reasonable efforts to secure the correct or complete address. If the correct or complete address is secured, UPS will attempt delivery and $10 an Address Correction charge will be assessed to customer’s credit card. If the product you ordered arrives via truck, TAKE YOUR TIME to inspect it. Many truck drivers pressure customers to sign the documents quickly. You have the right to take all the time needed to inspect the product thoroughly before signing. Please, remember that when the order arrives it is your responsibility to ensure that the product has not been damaged during shipping. Inspect the box for external damage, remove the packaging and inspect the contents for any physical damage in the presence of the delivery driver. If you see signs of transport damage, either refuse the package with no signature. If there is any damage, visible or not or any of the Items from your order are missing you must indicate such on the delivery receipt. When you sign the delivery receipt and do not note any damage, the merchandise becomes your property, and the freight company will not allow a claim. FaucetLine.com cannot accept responsibility for any damaged or missed product delivered via truck once you sign for a delivery with no information about the problem on the delivery receipt, but we will work with you to resolve the claim with the carrier. PLEASE NOTE: The freight delivery company is not responsible for unloading the item from the truck or lift gate and carrying the item into the building. We recommend that you have someone with you to help unload the item from the truck and carry it inside. Should you fail to comply with the arranged delivery time, you will be responsible for any additional charges for redelivery and/or storage fees established by the freight company. PLEASE NOTE: We cannot be held responsible for mistakes made by the consumer in orders. If you have given the wrong shipping address to us or the shipment was refused for any reason, you as the consumer must take responsibility for this and pay Shipping and Restocking Fees. If you find internal damages or receive incorrect item you must to notify us within 7 days of delivery (3 days for DreamLine products). Products that are damaged or defective can only be returned for replacement (for the same item). We will not accept damaged or defected merchandise that was not claimed within 7 days of delivery (3 days for DreamLine products). Failure to follow these instructions within the time-frame stated may result in losing the right to compensation. We are not responsible for any missing parts that were not claimed within 30 days of delivery. In this case please contact to the manufacturer for the missing parts. To notify us of wrong quantity shipped please and we will ship the missing items immediately. Please note: FaucetLine.com is not accepting any changes over the phone. All requests must be submitted in writing. Once we receive an order change request, the new confirmation email will be sent to the customer to confirm the changes. If the price for a replacement item is more expensive than the original – we have to cancel this order. The customer can place a new order instead. .
You may cancel your order, for any reason, and receive a full refund if your order has not entered the shipping process. When the items you order are in stock, we'll start the shipping process within 15 minutes of receiving your order. Many of our fulfillment center processes are automated and computerized. For these reasons, we are unable to move in to the fulfillment centers physically to stop the shipments. If your order has entered the shipping process then you may not cancel an order (either shipping to you). If you would like to return an item that has already entered the shipping process, please see our Return Policy. You can refuse this shipment when it arrives. Refusing the shipment allows you to return it without having to pay for return shipping. Once an item has entered the shipping process the terms of our Return Policy will take effect. You will be subject to a 25 - 40 % restocking fee (depending on manufacturer) for any items that are not defective or damaged during shipping. All cancellation requests require that an email be sent to Customer Service stating your name, order # and reason for cancellation. To return any product, you must obtain an RGA (Return Goods Authorization). All returns require a Return Goods Authorization (RGA) number issued by Customer Service Department. RGA numbers must be written on the outside of all returned packages. Items returned without an RGA form will not be credited. You are solely responsible for risk of loss on all returned shipments. Items can be returned within 30 days of the date the product was shipped and will be subject to a 25 - 40% restocking charge depending on manufacturer (see the list below). Shipping charges are not refundable. No products will be accepted for return more than 30 days after date of shipping. *Tile Redi only accepts Product EXCHANGES with 20% Restocking Fee. There are NO RETURNS on Tile Redi products. All EXCHANGES must be within 10 DAYS from the receipt of order with ORIGINAL RECEIPT. Contempo Living - NON RETURNABLE products. PLEASE NOTE: Special order items cannot be returned once they have shipped. PLEASE NOTE: Installed product cannot be returned for credit. PLEASE NOTE: Discontinued items by a manufacturer are non-returnable, non-refundable, and non-cancelable. In order to receive a replacement for returned product FaucetLine.com must receive payment for all products prior to shipping of any replacements. Temporary duplicate charge will be placed on your credit card until the returned product has been received and processed. All returns must be in "as-new" condition, and in the original packaging, complete with manuals, registration cards, and accessories. No returns accepted for Items without the manufacturer’s original box. You are solely responsible for risk of loss on all returned shipments. All returns are inspected at our warehouse. If the item is determined to have been installed or used in any way, credit will not be given and the product can be returned to you at your cost. Please allow 15 business days for the processing of returned merchandise. Allow 20-60 days for processing of refund for damaged products occurred by UPS/FedEx or Truck Company. ONCE AN ORDER FOR ANY ITEM MENTIONED ABOVE HAS BEEN PLACED AND SHIPPED, IT CANNOT BE CANCELLED AND IT CANNOT BE RETURNED. FaucetLine.com will not honor requests for exchanges under any circumstances. We accept exchange for damaged or defected products only. PLEASE NOTE: We can't replace defective items that have been installed. In this case please contact to the manufacturer for replacement. For security reason we do not keep credit card information and your credit card will be charged at the time you place your order even the item is a special order or on back order. Most of the orders are directly shipped from the manufacturer. If the item you ordered is not in stock or a special order, we will get your approval about the delivery time. If you agreed to wait we have to charge your credit card before your order will be shipped. PLEASE NOTE: Orders over $10,000 must be prepaid by wire transfer or company check. A $30.00 charge will be added to your account for checks returned for any reason. Please be advised that due to human error, our site may list incorrect pricing. While we make every effort to ensure these mistakes do not happen, FaucetLine.com cannot honor incorrect prices. If there is a price change on an item you've ordered, we'll contact you for confirmation before processing the order. Additionally, due to the differences in monitors, technical factors, and characteristics of some of our finishes, the colors shown here cannot be represented with all their true qualities. The images should only be considered a guide. FaucetLine.com is not responsible that your monitor will accurately display the actual colors of the merchandise. Any details as to products, including product descriptions, specifications, images are provided by the supplier or manufacturer of the product and are reproduced for the convenience of our users. This information is not verified or substantiated by FaucetLine.com and FaucetLine.com is not responsible for any inaccuracies or omissions. For specific information on a particular Unit, please contact the manufacturer directly before making a purchase. 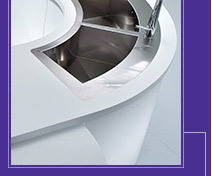 FaucetLine.com sells only quality products from leading industry manufacturers. All products are covered by the manufacturer's comprehensive warranties. No matter where you live within the U.S., the manufacturers provide complete and documented warranties with every product. Some products may have limited LIFETIME warranty which would be clearly mentioned on the product packages. If you have purchased a product from us and you find it to be defective within the first year of use, please contact manufacturers. FaucetLine.com is not responsible for any shipping fee or installation fee to replace or repair items under manufacturer warranty.